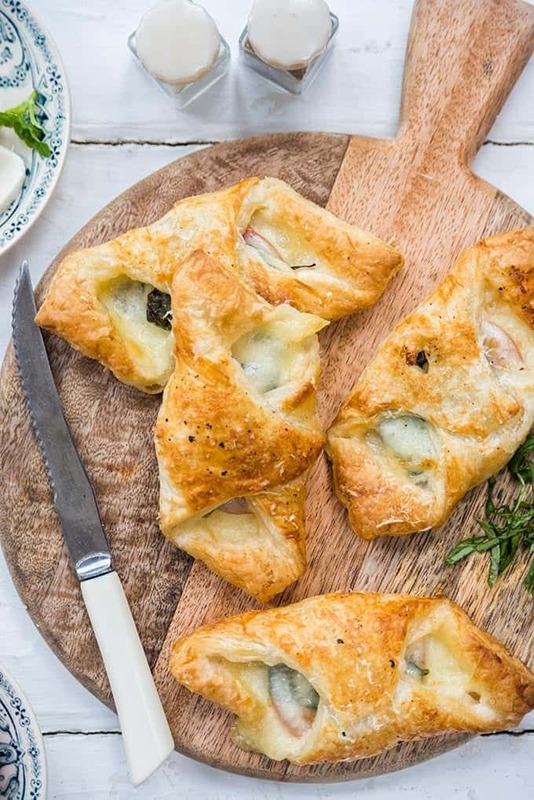 These super-easy vegetarian Caprese puff pastry parcels are great as a quick snack or appetiser. Puff pastry – that stuff is awesome, am I right? Especially the pre-rolled packs that can be used straight away to turn into sweet or savoury yummies. My daughter recently announced she wanted to ‘bake’ and she made little puff pastry strawberry jam tarts almost unaided. I usually grab the puff pastry whenever I have friends coming over for dinner. You can use almost anything in your fridge to make tasty appetizers. This time I went for the classic Caprese combo of fresh mozzarella, tomatoes and basil. As you can see from the video, these are embarrassingly easy to make. They are even easier to eat… just make sure to let them cool enough or you will burn your mouth as I did. Too eager, that’s my problem!